Offering you a complete choice of products which include cable trolley, crane cable trolley, i beam festoon cable trolley, wire rope steel cable trolley, hoist cable trolley and c rail steel cable trolley. Keeping in mind the end goal to provide the exact prerequisites of our customers, we are putting forth a wide grouping of Steel Cable Trolley that is suitable for EOT Cranes, Gantry Cranes, Overhead Cranes, Jib Cranes and Electric Hoists. 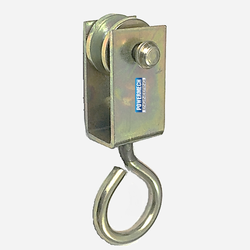 Offered steel link trolleys are given in distinctive evaluations in understanding to the needs of our clients. It is valuable in material taking care of, general development, truck stacking, and load and convey work in quarries, sand and rock pits. Our gifted experts made these steel link trolleys by taking high review parts in consistence with set quality guidelines. Being a quality focused organization, we are able to provide our valued clients Heavy Duty Cable Trolley that is used in cable management in moving machinery. Our highly skilled workforce processed the offered heavy duty cable trolley in line with the industry laid parameters. Moreover, our offered heavy duty cable trolleys are highly demanded by our clients for its quality and long service life features. Apart from this, we are offering these heavy duty cable trolleys at very reasonable prices. POWERMECH® supply various types of heavy duty festoon cable trolley in steel suitable for any size of I beam to hold multiple cables for heavy duty EOT Crane, Overhead Crane, Gantry Crane, Moving machinery, Electric hoists, Material handling equipment, Liquid painting plants, Transport dip pre-treatment plants and more. This heavy duty festoon cable trolley has two layers of cable saddle to hold various sizes of cables, steel and rubber cable holder to rigidly and safely hold cables. 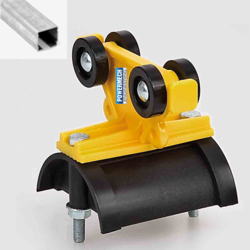 These cable trolleys are supplied to travel on straight or curved I beam. Heavy duty festoon cable trolley is supplied as per requirement of customer to suit existing I beam for replacement or for first time installation. 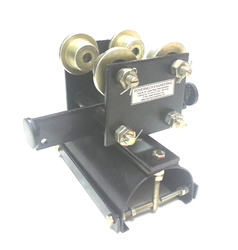 Heavy duty festoon cable trolley is also supplied as per customer’s drawing / sample. POWERMECH offers Wire rope cable trolley in steel and is suitable to travel on 6mm, 8mm, 10mm diameter steel rope. This festoon cable trolley can used to tie and hold single or multi cables. 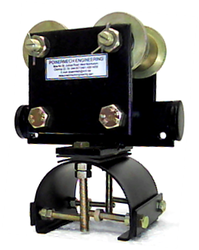 POWERMECH offers Cable Trolley with two wheels for holding single round or flat cable. This cable trolley can be used on I-Beam or T track for Hoist application. POWERMECH offers Festoon Steel Cable Trolley suitable to travel on C Rail Channel. • Type of roller: Steel roller with ball bearings. • Steel Saddle size: 68mm (maximum space to accommodate Flat cable’s width / Round cable diameter). • Screw length: 48mm (maximum space to accommodate Flat cable’s thickness / Round cable diameter). • Travel speed 80 meter/min maximum. Application: C Track Rail Festoon System that is used for electrical or energy transmission in EOT Cranes, Jib Cranes, Gantry cranes, Electric hoists, Galvanising process plant, Phosphating process plant, transfer car, transfer trolleys and various type of material handling equipment and moving machinery. 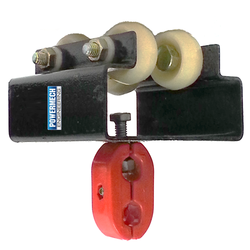 POWERMECH offers PA / Nylon / Plastic Festoon Cable Trolley to travel in C Rail Track with four wheels. These cable trolleys suitable to carry Round / Flat cables. • Material: PA / Nylon / Plastic. 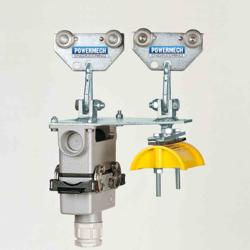 POWERMECH offers a Special Cable Trolley with Plug and Socket Connections, 24 Pole, to connect Festoon System to the Push Button Pendant Station. • Steel Saddle size: 68mm (to accommodate Flat cable’s width / Round cable diameter). Cable Trolley (Body: Steel, with Plastic Hanger Clamps with 4 Nos. 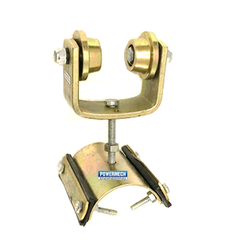 Nylon Wheels Fitted on Metal Sheet Cable Clamp Size: 12/14mm Suitable to Travel on 'I' Beam Size. Cable Carrier Trolley with steel sheet, heavy duty plastic hanger and four nylon wheels to hold travelling round cables. These Cable Carrier Trolley is suitable to travel on I-Beam or T-Channel / Track. 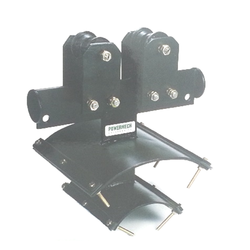 Heavy duty plastic hanger clamp is available for different size of round cables. Looking for Festoon Cable Trolley ?